There is a paper by Randolph Starn in that van Engen volume I mentioned starting so long ago, called “Who’s Afraid of the Renaissance?”.1 Its main purpose is to argue that medievalists and Renaissance scholars cannot afford, for all that they do subtly different things with their material, to exclude each other from their orbits. This may well be true but as someone whose period comes nowhere near the Quattrocento I’m not worrying too much just now. He does however say some interesting things about periodization. He observes as an initial point that if you imagine there was a Renaissance at all, you are implicitly accepting three periods; the Renaissance itself, the golden period which it revives, and the interval in between in which that period was in eclipse. We usually call these the Renaissance, Antiquity and the Middle Ages respectively of course but they are all required by the concepts embodied in the first alone, and some have rejected them. Again, all fine. But because one of the things that occupies Renaissance and late medieval scholarship, he argues, is setting the boundary between each other, a boundary that he argues is unhelpful, it is very focused on a grand narrative transition between epochs. And he argues that this is unhelpful because it neglects things that don’t fit the story, and this is also all very fair and true and needs not to be forgot. So his alternative is to suggest, rather than a narrative approach, a genealogical one. He suggests that rather than telling one story we follow lines down, or up, through history, looking for connections as a genealogist looks for ancestry or descent, expecting some branches to stop, other new ones to `marry’ in, thus allowing things to enter and leave the family without prejudice to their importance or the family’s. I quite like this conceptually, even though I don’t usually have to worry about grand narratives (except the ruddy feudal transformation) because of focusing on nature’s narrative duration, the lifespan, rather more than many. He is certainly right that this allows for a more nuanced and personalised reading of history than a truly big story like `the end of the Middle Ages’, and various analogies with modern family tree software that lets you zoom in and out on particular generations or groups could also be worked in.2 The trouble comes when you stop trying to work vertically. A real family tree or genealogy has siblings on it. It also has collateral lines, running in parallel but not directly linked. This model has no power to distinguish between the two. Let’s take the good old Transformation, since I can discourse on it easily. 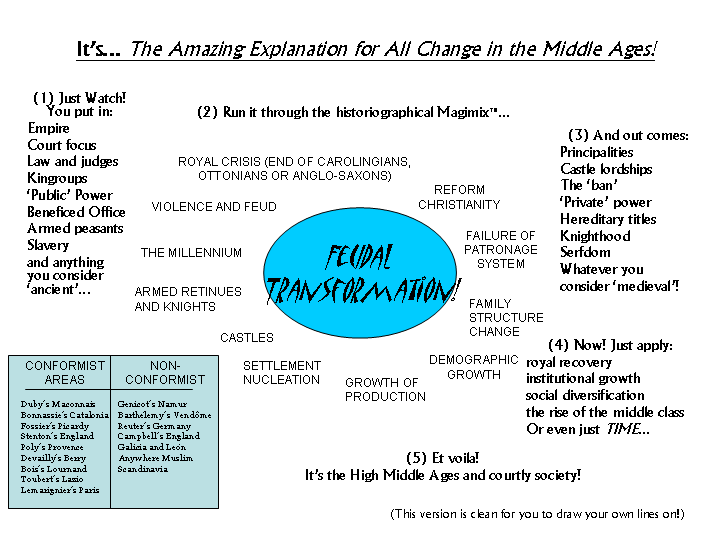 As you’ll see from the diagram thumbnailed below, I have views on how things derive in the feudal transformation. I’d also like to keep them so please, if you should find it useful, use it with my name attached and copyright recognised, without other change. But back to the thread. Somehow, for example, we descend down this notional tree from, for example, a system where the court is the dominant field of political interaction to one where castle lordships are as high as it gets. We also descend from, let’s pick something fairly neutral, an armed yeomanry to a subject and disarmed peasantry who are `protected’ by armoured horsemen. So is the court the `sibling’ of the armed peasantry? Is the castle the `sibling’ of the knights? That latter sounds as if it makes sense, the former less so, though it’s kind of been argued. So which of those two from the upper generation is the parent of the latter two? Do they in fact give rise to either? Even together? Or are they in fact separate `families’? Why are they on the same tree then? And yet they clearly are related, even if only by time, whereas our scheme demands more consequence than that. So I think it’s a nice idea, but when I try and put something I want to explain into it, it doesn’t help, and probably forces me to make false associations or ignore important ones. Therefore I suspect that it’s not much use for explaining things that actually happened. We may have to keep telling stories instead. 1. Randolph Starn, “Who’s Afraid of the Renaissance?” in John van Engen (ed. ), The Past and Future of Medieval Studies (Notre Dame 1994), pp. 129-147. 2. I should speak a word here for Spansoft‘s Kith & Kin, which has been helping me keep families sorted and Catalan noblewomen called Adelaide distinct since 1999. Not that modern, therefore, although current versions look very different from what I started with (a shareware version that you can still find on the internet in places), but really quite robust and useful. Doesn’t deal gracefully with cousins who marry, though; if anyone knows anything that does, I’m open to suggestions also. No flag there, but just over the crest, coming down off the hill onto a viaduct that took us across the next precipitous valley, one approaches the bridge from an oblique angle, which meant that we had plenty of time to observe that flag painted vertically up all sixty feet of the far side’s concrete piling. Invisible from the viaduct, impossible to miss from the hill, and testimony to a good few nights’ work with ropes and cradles I rather think! Strong convictions are at work here. These flags were often accompanied by slogans, most obviously the perennial “Catalunya no es Espanya!” but sometimes more serious ones like (I translate) ‘three hundred years of occupation and resistance!’. It’s a live issue here. The Catalan language was suppressed by Franco, and until the early 1970s, you could be jailed for speaking it in public. Although the language is now declining again, stickers saying “En català si us plau!”, ‘In Catalan, please!’, were not uncommon sightings during our stay. And we managed to be there during the General Elections, too, in which across Spain as a whole both mid-right and socialist parties gained seats and the socialists stayed in power. In Catalonia the right did not make any ground, and the country’s only remaining deputies from l’Esquerra, the far left party, were elected in Catalan seats. The paper next day was saying how Catalonia’s Socialists had kept Zapatero in power. Lots of people remember Franco in Catalonia. And as a consequence, the flag gets everywhere. … you can’t really see very far from the hilltop. The controversy over dating extends to the church. As I say, the existing fabric is eleventh-century, very early Romanesque, but when it was briefly dug in 1943, they found foundations of a smaller stone church beneath its floor. Now, prevailing opinion is that a stone church is very unlikely to have been put up on this hill in 889, though the local stone, of which the tower is made, is pretty easy to work. That implies either, that the foundations they found were from late tenth-century, and that church was almost immediately replaced by the current one; or else it implies that the stone church was there from much longer ago. At Santa Margarida de Martorell they have extensively dug a church that turns out to have been standing, subject to various alterations, since at least 351, and other places like Casserres and Olèrdola suggest that a hilltop like this could well have been the centre of a late antique necropolis. Sure enough, the one other test excavation that’s been done up here, at a place on the hill called Pla de les Lloses, ‘plain of bones’, turned up burials, but as the `dig’ was only a hole 50 cm by 50 cm, exact dating was tricky, and the ceramic sequence round here is almost useless for this anyway: the material culture as it survives in the record irritatingly fails to change at all during all these huge changes we feel sure peasant society was experiencing in the tenth and eleventh centuries :-) (It does however spread.) So the very old church, perhaps being reconsecrated in 889, is a definite possibility. And you can hear the Catalan flag fluttering off to your right, and it’s not just in one’s own mind that that tower, charter, church, memorial, town and flag are connected. When they say “Catalunya no es Espanya!” they know that the difference goes back to ‘Carlemany’ and that events of eleven hundred years ago are still significant because of the different, non-Castilian past to which they connect the people today, who fear for the dissolution of their language and whose support the political parties of the area have to court with talk of independence. That flag would have meant nothing to Centuri, who probably had his own strong views about centralised government, but it’s rooted, quite literally, in what he did, because the fact that that is known is part of what makes it possible to fly it. The reason this article got my attention however is David’s take on why people write charters. As I say the echo of Rome doesn’t convince me, and sometimes it was honestly, I’m sure, just an attempt to record something. Just, maybe not that often. All the same, David was wise to such concerns when he was writing; as anyone familiar with his work will know, David’s subtle prose can almost conceal that he is not so much thinking outside the box as leaning nonchalantly on its sides so as to push them out without you noticing, prior to pointing out that by now we’re standing in quite an odd place. An overworked metaphor, but I’ll explain the bit of this process that bit me in this article: in the middle of this fairly thick stuff about symbology and invocation of legal remedy, he suggests briefly that some people might have made donations that they had no intention of carrying out, simply so as to have their ownership of the property written down somewhere. From a modern perspective that seems crazy—the one way not to prove your ownership of something (whatever that might mean in the early Middle Ages) is surely to record your giving it to someone else!—but it does also indelibly associate you with the property and that association, we get readier and readier to accept, was not easily forgotten.4 It’s all very well saying that that isn’t the idea, but David is there to remind us that the people of the early Middle Ages didn’t necessarily have the same ideas as we do. 1. David Ganz, “The Ideology of Sharing: apostolic community and ecclesiastical property in the early Middle Ages” in Wendy Davies & Paul Fouracre (edd. ), Property and Power in Early Medieval Europe (Cambridge 1995), pp. 17-30. 2. For the actual Roman precedents of early medieval diplomatic, the classic work, more cited than read as the saying goes, is P. Classen, “Fortleben und Wandel spätrömischen Urkundenwesens im frühen Mittelalter” in idem (ed. ), Recht und Schrift im Mittelalter (Sigmaringen 1977), pp. 13–54. 3. It makes a useful counter to the inevitable Terry Jones arguments of a corruptly rich Church that you might get from books like Lester K. Little, Religious Poverty and the Profit Economy in Medieval Europe (London 1978). 4. This is now most ably brought out by the work of Barbara Rosenwein, especially her To Be the Neighbor of Saint Peter: The Social Meaning of Cluny’s Property, 909-1049 (Ithaca 1989). An odd thing that I found while staying with family in the area, I felt I should report. My half-nephew is more interested in my field than most kids of his age would be, and dragged out for my inspection a book, which transpired to be a cartoon history of Catalonia’s founder figure, Count Guifré the Hairy (so called, intones the 12th-century Gesta Comitum Barcinonensium, because “he had hair in places which other men did not”1). I foolishly didn’t take down details at the time, but it wouldn’t have helped me much because the web seems almost empty of what it was, which I’m fairly sure is A. Jofré Battlorí, Històries i Llegendes de Catalunya, 7: Guifré el Pelós, Col·lecció Ayax (Barcelona s. d), one of a series of several which included, sadly, Comte Arnau (who was not real!) but also plenty that was solidly historical. Now of course as the above image may suggest Guifré is quite deep in the Catalan national consciousness, but as I read I was quite spun by this book. Partly because it was weird to see people I’ve visualised in someone else’s versions. For example, I never think of Radulf, Guifré’s son who is oblated as a monk, rebels and leaves to be a priest instead and eventually becomes Bishop of Urgell, as blond,2 but I never would have realised that without someone else picturing him so. And I had never really stopped to think about what Cardona would have been like to come to as a traveller in Guifré’s time, mainly because I’d kind of forgotten it was on roads that were still in use then even when it was supposedly depopulated. Various things like this that make me wonder how much use such attempts to represent our imaginings are in actually getting us closer to the missing reality… Though I personally imagine even the poorest Catalans wearing at least one colour other than brown, which Batllorí seemingly did not. But also, the history was pretty solid, and this was because the artist had as advisor no less a figure than Josep María Salrach, who is currently I suppose the leading man of the field and was probably so whenever this was written (my half-nephew’s copy was shiny and new, but Batllorí died in 1999, so it must have been a reprint or a very nice remainder). The effective result of this was that you got various properly cartoon action (I wish I could have scanned some of it for you) interspersed with travel sequences basically set up so that Salrach could dump exposition into them (“King Odo is a long way away, son, and cares nothing for his forgotten frontier” and so on). Lots of political thought on horseback therefore. But still, it’s an astonishing thing for a real historian to be involved with. It’s as if, in England, someone wrote a cartoon history of Alfred the Great and got Simon Keynes to advise. I mean, that would probably work; I wonder if it has actually happened? 1. L. Barrau Dihigo & J. Massó Torrents (edd. 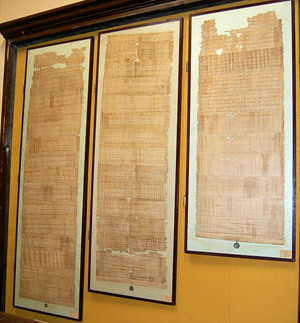 ), Gesta Comitum Barcinonensium: textos llatí i català, Cróniques Catalanes 2 (Barcelona 1925). For work on Guifré in English one is basically limited to Roger Collins, “Charles the Bald and Wifred the Hairy”, in Janet Nelson & Margaret Gibson (edd. ), Charles the Bald: Court and Kingdom, 2nd edn. (Aldershot 1990), pp. 169-188. In Catalan, the most recent thing I have seen is R. d’Abadal i de Vinyals, El Temps i el Regiment de Guifré el Pilós (Barcelona 1989), but there is also Jordí Mascarella i Rovira & Miquel Sitjar (edd. ), Guifré el Pelós: documentació i identitat (Ripoll 1997). The Collins article is fun mind you. 2. On Radulf see Manuel Rovira, “Un Bisbe d’Urgell del segle X: Radulf” in Urgellia Vol. 3 (Montserrat 1980), pp. 167–84. On 4 March Professor Chris Wickham was addressing a joint gathering of the Institute of Historical Research‘s Earlier Middle Ages seminar and the London Society for Medieval Studies, and he was talking to the title, “Getting justice in twelfth-century Rome”. To me this was worth it mainly for the stories of years-long lawsuits, flagrant disregard of the results, corrupt judges and obdurate defendants that most medieval dispute studies can bring up; the actual conclusions didn’t seem terribly transportable as the story was mainly that Rome was very unusual. The particular oddity that was being looked at here was the way that a dispute in Rome might be taken either to the Pope, or, after about 1150, to the Senate. Neither seems to have been very good at settling things, taking a very long time to produce verdicts that then couldn’t be enforced, and which might be appealed from one court to the other. It’s difficult to prove a judicial verdict is ever enforced, of course, but here we have a much higher incidence of preserved returns to court, for a new sentence after one had proved ineffective, than we get from elsewhere, and that must at least mean that such records were likely to be needed in the medium-term, which in turn speaks for an inconclusive system. What didn’t really become apparent was why the Romans persisted in using the system, although there was of course the possibility opened that mostly they were not and we were seeing only cases that people couldn’t resolve any other way, which might in turn explain why so few were settled… But there are circles here, though Chris’s work will no doubt slowly square them. Then soon after I got back, 19 March, there was Professor Stephen White, talking to the Earlier Middle Ages seminar to the title, “A Paranoid Style in Medieval Political Culture? The Taste for Legal Melodrama in 12th- and early 13th-century France and England”. I know Professor White’s work primarily through having reviewed a volume of his collected papers, and that gave me an impression of a very hard-nosed attitude to dispute records leavened by an interest in the actual characters in the disputes, which I can generally get behind. So I was slightly surprised to find I was listening to a paper about twelfth- and thirteenth-century romances, in which Professor White has found a pattern of disputing that he thinks tells us about political culture in those areas, especially under the Angevins. The pattern was basically that someone is falsely accused by a traitor, who takes in the corrupt and febrile king (often Arthur or Charlemagne) and is only thwarted by sane old counsellors insisting that the matter be taken to trial by combat, in which the wronged hero wins so that the balance between corruption and honour is, often briefly, restored. These stories do seem to have been popular, or at least, there seem to have been a lot of stories with these moments in, but disagreements from the floor centered on the variation between the stories in which they appeared, how important the dispute was to the rest of the story, how much extra diversity could be found in the pattern when you started to look, and of course, whether literary evidence like this really connects to the world. To the last, Professor White suggested that in the conflicts that rolled up the Angevin Empire before Philip Augustus, actually things that put tests of loyalty and misfortune from faulty rulers at the centre of their themes might have found an unsually sympathetic audience, but I still personally left thinking that little had been proved except that there are a lot more medieval romances than anyone can be bothered to read except when looking for particular motives. But is gutting literature for use as a context-less data-bank ever really sound history? It wasn’t as brute as that, but it was questionable, I thought, whether this could ever really tell us much about what people did, or even about the stories.